We took a look at this kind of “enough-flour-to-roll-out” recipe when we looked at a more modern version of molasses cookies. Visit that entry to see more iterations, but from that, here’s my suggestion: when you see roughly equal amounts of molasses, sugar, and shortening, but no egg, assume around a 4:1 ratio of flour to molasses. When you see egg, assume a 5:1 ratio. So here, I’d suggest trying four cups of flour. Make soft dough and cut with cookie cutter. 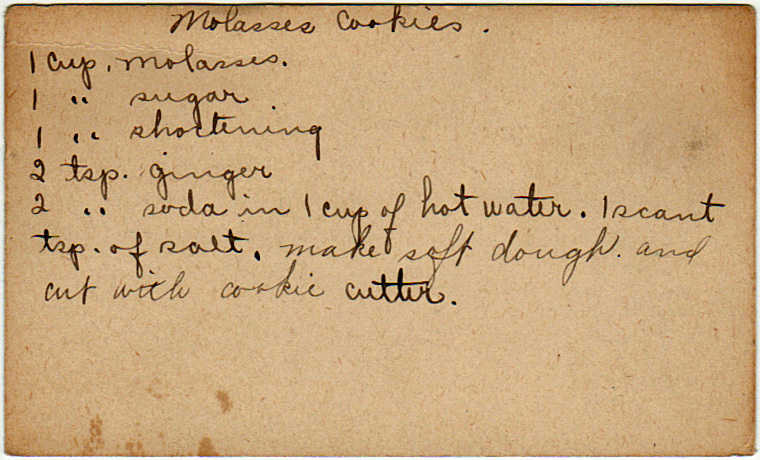 Yesterdish suggestions: There are a couple things about this recipe the author of the card just assumes you know. The more important one: chill the dough in the fridge for a hour before you roll it out. No-egg molasses cookies like this typically get baked at about 425 deg. for about seven minutes, and depending on the size of the cutters, will yield between 18 and 24 cookies. For any of these “enough-flour-to-roll” recipes, a common variant was to roll balls of the dough in sugar, then press them into flat circles with the buttered bottom of a drinking glass.